Uniquely manufactured to your SPECIFIC LENGTHS = ZERO WASTE! AWS decking is suitable for a wide range of markets. AWS decking is available in various lengths, made to order. Get the length you require so you are not paying for waste. AWS Wood Plastic Composite (WPC) is an engineered product combining the wood of nature and the plastic of modern living. AWS embraces the change in consumer requirements and have developed a range of decking for the market and looking towards the future. AWS decking is easy to install and requires no special tools. Our Australian made composite decking system gives you all the benefits of wood while enjoying the unique properties of PVC. By combining wood and PVC in a single material AWS composite decking gives all the comfort and demands you make of your patio planks. Water resistant and robust, low maintenance and attractive, our AWS decking system has everything! It combines the warm feel of wood and the durability of PVC. 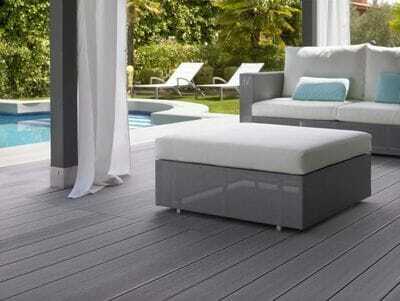 Thanks to the natural appearance, AWS composite decking planks blend in perfiectly with your garden. With water resistance, your patio is guaranteed to stay like new, and is splinter and split free. Note - some fading may occur over time which is a natural process with composite materials. From garden path to pond-edge, from patio to pool-side, with AWS composite decking you'll enjoy it all the more. With AWS decking you can give creativity free design. From formal design to fanciful geomatric shapes, AWS composite decking boards come in a range of different finishes. Choose from flat, grooved or reeded boards with AWS decking you can transform your patio, garden or pool area into a stylishly finished environment that you can enjoy for years to come.